Make self-care a relaxing ritual with this rose quartz crystal-infused bath set. Rose quartz is known as the stone of unconditional love. 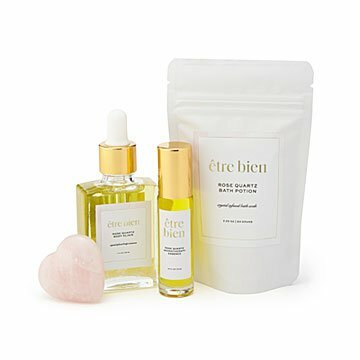 Keep the coral crystal close next time you treat yourself to some much-deserved me time with this all-in-one bathing ritual kit. Created by Tori Marinelli , the set includes a heart-shaped rose quartz crystal and three soothing botanical potions. To use, first set your intention. (The maker recommends, "To feel loved and compassionate," but it's entirely up to you.) Then, fill your tub, sprinkle in a bit of the bath salt, and drop the quartz into the brew. When you're done with a relaxing soak, rub the crystal-infused, rose-scented body elixir gently over damp skin. Complete your ritual by rolling on a bit of aromatherapy essence and taking a moment to thank yourself for all that TLC. Made in New York City. Ritual: Apply generously to the body, gently massaging the oil into skin with love and intention. For maximum hydration, apply to damp skin and use daily. Ritual: Apply liberally to pulse points with love and intention. Inhale the aroma deeply, focusing on unconditional love, for yourself and others. Reapply throughout the day to stay present and mindful. Ritual: After setting an intention for your ritual, gently sprinkle salts into a warm bath. Add the rose quartz crystal into the water and soak until completely relaxed, allowing the potion to work its magic. I decided to order this to try the rose quartz bath potion and the rose scented oils. The slight scent of rose was just perfect (not overpoweing) and the feel of the ingredients against my skin felt very moisturizing. I did rmanage to relax which is something I am not very good at. Followed up with the body elixir and aromatherapy essence. Both a mild scent of rose which was I loved as many rose scents can be overwhelming. A great treat for myself.